This Arthur Penn film, with many opposing moods and shifts in tone (from serious to comical), was a cross between a gangster film, tragic-romantic traditions, a road film and buddy film, and screwball comedy. It exemplified many of the characteristics of experimental film-making from the French New Wave (Nouvelle Vague) movement of its time. The most classic of all its scenes was the shocking and tense "ballet of blood" finale - an ultra-violent, country backroads ambush set for Bonnie Parker (Faye Dunaway) and Clyde Barrow (Warren Beatty), the doomed lovers. The ambush scene was marvelously choreographed and edited, with multiple cameras shooting at different speeds. In their final freeze-frame of life, with a silent glance at each other, Bonnie and Clyde revealed both panic and love in their faces - knowing that something was ominously wrong and that they were facing their ultimate destruction, the natural result of the escalating violence. Clyde was outside the car and Bonnie was trapped in the car behind the sedan's steering wheel. Then from the point of view of Sheriff Hamer's deputies, their frenzied corpses writhed in slow-motion as they were gunned down, 'shot,' and riddled with bullets - even a piece of Clyde's brain was propelled from his head [Note: it was a deliberate reference to the JFK assassination, in which a piece of Kennedy's brain was seen flying in the Zapruder film.]. They died cinematically-beautiful, abstracted deaths to accentuate the romance of the myths and the larger-than-life legends that surrounded them. Their corpses twitched to life and were re-animated by gunfire - involuntary dances of death. Their last moment of 'life' occurred when Clyde rolled over gently in slow-motion and Bonnie's arm dangled unnaturally and then stopped moving. Bonnie's flowing blonde hair, streaked in sunlight and gently blowing in the breeze, cascaded down in many arcs as she hung out of the car. In the so-called "Sounds of Silence" sequence accompanied by the music of Simon and Garfunkel, recent graduate Benjamin Braddock (Dustin Hoffman) was being tempted into an affair with older seductress Mrs. Robinson (Anne Bancroft), the mother of his innocent doe-eyed girlfriend Elaine (Katharine Ross). When accused of being a virgin in a hotel room with the older woman, Benjamin reacted with outrage. He slammed the bathroom door, extinguishing all light in the room. In the darkness, the soundtrack reprised: The Sounds of Silence: "Hello darkness my old friend, I've come to talk with you again..." The scene shifted to the Braddock's swimming pool surface, where Ben sunbathed on a black inflatable raft, drank beer, and wore wrap-around sunglasses to shut out the glare of the external world. With clever transitional devices and a montage of images (edited in meaningful juxtaposition) suggesting the emptiness and joylessness of his life during the summer, he walked back and forth transparently between his two pursuits and two major worlds: his parents' affluent house and pool, and his Taft Hotel room with Mrs. Robinson. He rolled off the raft in the backyard pool, pulled on a white shirt, and entered a doorway to the Braddock home. Through the door, he emerged into the hotel room (a Hotel Taft towel hung on the inside of the bathroom door), where Mrs. Robinson (with her back to the camera) was removing her necklace. He laid against the bed's mostly-black headboard, as Mrs. Robinson (in a black bra and slip) sat next to him, leaned over, unbuttoned his white shirt (one button at a time), and caressed his chest. Benjamin blankly stared into space against a black background - the image emphasized his sterile environment. He rose from his bed, walked to the door (now in his own house) to shut it - briefly glimpsing his parents eating dinner in the dining room and worriedly gazing at him. More ingenious editing cuts occur. After reclining to watch TV on a black chair, a jump-cut showed him back in the Taft Hotel bedroom, watching television and drinking a beer while resting against the bed's headboard. A female figure in a white bra walked past in front of him and the television, dressed, and left the room. His reflection was shown in the hotel bedroom's mirror. Then in another cut, he was resting against a black pillow in his own bedroom. He put on his black swimming trunks, grabbed a towel, left his room, passed his mother, and dove into the backyard pool from the diving board. One of their many sexual contacts was symbolized by Benjamin rising up onto a inflatable rubber pool raft (after the dive), disorientingly inter-cut with his landing on top of Mrs. Robinson in the hotel bed. In another disorienting cut from their sexual coupling to his lounging on a raft in the backyard pool, the sound preceded the picture when his father asked: "Ben, what are you doing?" Ben turned and squinted toward his despairing father who stood over him by the pool and questioned his continued laziness and lack of direction. This classic car-chase/cop film contained one of the screen's all-time best car chase sequences (at up to 110 miles per hour), for the 10-minute sequence filmed with hand-held cameras up and down the narrow, hilly streets of San Francisco. Police lieutenant Frank Bullitt (Steve McQueen) was chasing after criminals in his car through hazardous intersections. Bullitt's car was a Highland Green, 1968 four-speed Ford Mustang Fastback GT (California yellow-on-black license JJZ 109) powered by a 390/4V big block engine, in pursuit of a black, 1968 four-speed Dodge Charger 440 R/T. The classic chase ended when the bad guys lost control and crashed into a gas station - with a fiery explosion. However, there were continuity errors in the sequence, including an oft-viewed green VW Beetle, and the 6 hubcaps that fell off the Charger's wheels. This Italian western had one of the most memorable opening credit sequences of all time. The trio was sent by cold-blooded, blue-eyed killer Frank (Henry Fonda in a cast-against-type role) to await the arrival of a train. Finally, a mysterious stoic man with no name playing a harmonica, named "Harmonica" (Charles Bronson) was let off the late-arriving train. He fatefully mentioned that the trio of gunmen "brought two too many" horses and after a shootout, he was proven right -- all three gunmen were killed. Stanley Kubrick's landmark, science fiction classic, in the opening Dawn of Man sequence, contained one of the most famous jump-cuts in cinematic history. In slow-motion, the man-ape leader flung his weapon, a fragmented piece of the bone, exultantly and jubilantly into the air. it flew and spun upwards, twisting and turning end-over-end. It was followed by a jump-cut of four million years transitioning into the next segment. In a great transitionary, associative image to the next segment many eons later, the tossed bone (a primitive tool/weapon) in flight instantly rotated and dissolved into a white, orbiting space satellite from Earth. It was symbolic of a technological instrument, tool, weapon (orbiting nuclear platform) or machine from another era that was ultimately derived from the first tool-weapon. The toss of the ape-man's bone was metaphoric for a lift-off from Earth toward the Moon, and for the tremendous technological advances that had occurred in the interim. The pop cultural, mini-revolutionary film was also a reflection of the "New Hollywood," and the first blockbuster hit from a new wave of Hollywood directors (e.g., Francis Ford Coppola, Peter Bogdanovich, and Martin Scorsese) that would break with a number of Hollywood conventions. Easy Rider had little background or historical development of characters, a lack of typical heroes, uneven pacing, jump cuts and flash-forward (back-and-forth) transitions between scenes, an improvisational style and mood of acting and dialogue, background rock 'n' roll music to complement the narrative, and the equation of motorbikes with freedom on the road rather than with delinquent behaviors. Before the film ended, there was a momentary, quick flash forward prophetically revealing the film's tragic ending - it was an aerial shot of a fire burning alongside a highway. The final image of the film was Wyatt's motorcycle burning beside the road - an aerial shot floating upwards above his motorcycle. Director/co-writer Sam Peckinpah's provocative, brilliant yet controversial Western, shocking for its graphic and elevated portrayal of violence and savagely-explicit carnage, was hailed for its truly realistic and reinterpreted vision of the dying West in the early 20th century. The much-imitated, influential film was book-ended by two extraordinary sequences, both massacres. The gang of desperadoes were first assaulted in the film's opening ambush following a failed bank robbery in a Texas border town. And then in the film's conclusion, they were brutally destroyed as united comrades in a selfless, redemptive act - by a savage and vindictive Mexican warlord after a double-crossing arms deal. The two scenes included some of the bloodiest, most violent shoot-ups ever filmed. Peckinpah choreographed each of the film's two bloodbaths as a visually prolonged, beautiful ballet - a slow-motion, aesthetically breath-taking, non-gratuitous, lyrical, extreme celebration of bodies being torn apart by bullets. 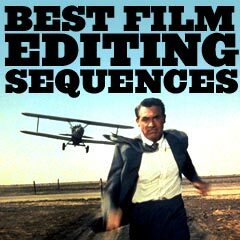 With numerous, elaborate montage sequences and staccato shifts, the film set a record for more edits (3,643 shot-to-shot edits at one count) than any other Technicolor film up to its time.